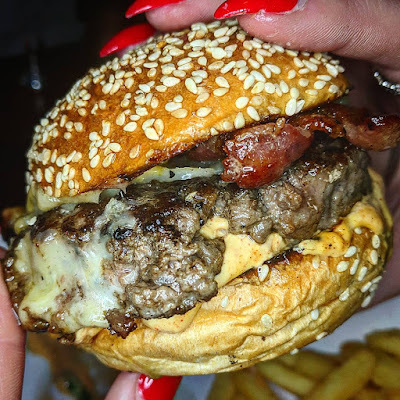 Venue: Any burger lover in London will know about Burger & Beyond. 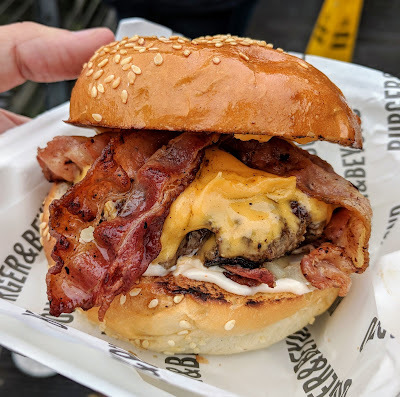 My first and only experience of them at Kerb Camden was not at all what I expected, as I was issued an above average bacon cheeseburger, but not the taste revelation I was hyped for. Perhaps it was a bad day and after speaking to various foodie friends, I was informed that the place to get the true essence of B&B was at Street Feast’s Dinerama. In the heart of Shoreditch, a stone’s throw from the station, this venue boasts some staple vendors in the London street food scene. The Burger: I was recommended ‘The BBB’ (Bacon butter burger), which is not actually available in Kerb Camden. Make sure you plan accordingly if you want to experience, arguably, the most well-regarded Burger & Beyond menu item. ‘The BBB’ boasts their signature 90 day aged patty, double American cheese, crispy bacon, burnt butter mayo and onion. Taste: Up front and to the point, this is the best burger I have had in London to date. It’s right up there with the best I have ever had in-fact. Leading with the 90-day aged patty, it was cooked medium well but still oozed with juices and flavour. The tenderness of the meat was sublime, likely testament to the ageing process of the beef. Paired with the thick, smoked bacon, the two most dominant flavours in this burger were through the meat — how it should be. The burnt butter mayo was well applied but also silky on the tastebuds, helping to reinforce the quality of the patty, perhaps where a less subtle sauce, such as a tomato or BBQ would have detracted from it. The same could be said for the cheese; American offering just enough to build on flavour without overpowering. The Summary: Simplicity is the name of the game and this is, above all else, what works for ‘The BBB’. The power of the flavour comes through the succulent, tender and juicy patty as well as the salty, thick bacon and is then complemented fantastically by the silky buttery mayo and cheese. The quality of all these ingredients speaks volumes as the taste buds are sent to heaven and back with every bite. This really is a 10/10 burger and I cannot wait to go back. The vibes at most street food venues are good, but I absolutely loved it at Dinerama. I’m yet to do many of the street food venues in London, but this will take some beating. Notably ’The BBB' comes in at £13 for a double. Don’t hesitate though. Double up. It’s worth it. Did I Dip It? This is already dipped in heaven. Venue: If you haven't heard of Patty & Bun, you're most likely doing something wrong. 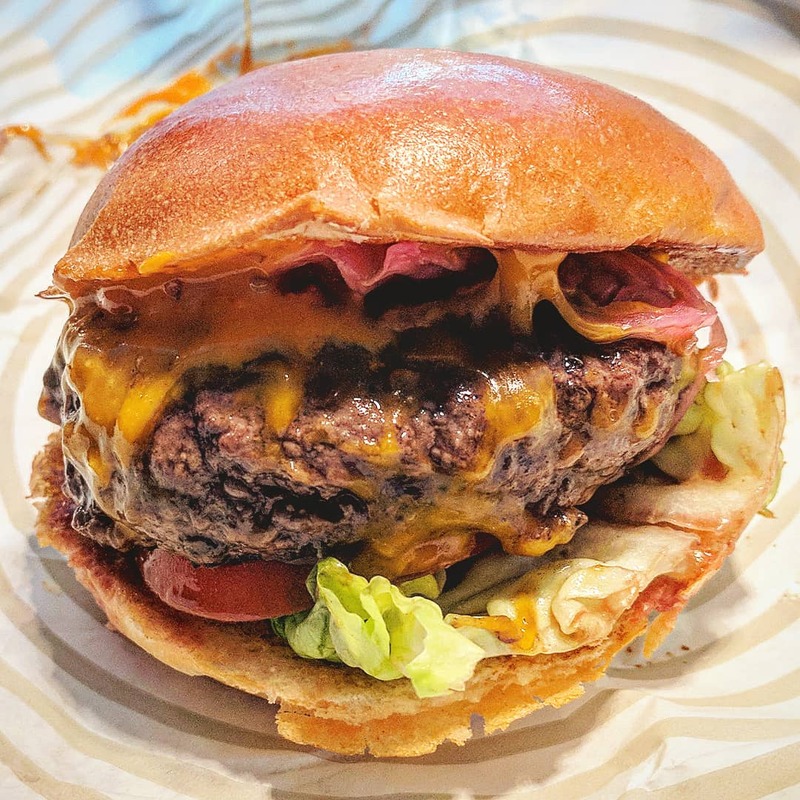 Big players in the London burger scene, these guys are now burger veterans going from a single pop-up store to over ten restaurants across London -- and growing. The Burger: The 'Ari Gold Cheeseburger' consists of a beef patty, cheese, lettuce, tomato, pickled onions, ketchup, smokey P&B mayo between a brioche bun. The Taste: The first bite gives you the answer as to why Patty & Bun is such a popular burger joint. Perhaps the most immediate flavour, as it should be, was the meat, cooked a perfect pink medium rare making it a truly divine experience. The cheese oozed from the patty, encapsulating the beef, without stealing too much of the flavour. The pickled onions offer an additional layer of taste, paired with the crunch from the lettuce and tomato. The sauces, absolute classics on a cheeseburger, felt balanced -- much love for the smokey P&B mayo in particular. The Summary: I've always loved Patty & Bun, perhaps more so than the other leading London burger chains. The 'Ari Gold Cheeseburger' is a masterpiece of burger simplicity. High quality, well seasoned meat paired with oozing cheese, fresh salad and delicious sauces. The only drawback, perhaps my mistake too, was not adding bacon. I feel like that extra flavour dynamic would have taken this burger to a 10. These guys are killer on social media with some great offers and freebies. The £5 lunch burger in particular always rocks. Did I Dip It? Absolutely not! Venue: After a few fairly average meals, Gourmet Burger Kitchen dropped off my radar for quite some time. In-fact, with burger culture so prevalent in Brum in the past few years, I realised I actually hadn't been back for over a year. However, with some solid specials on with the affordable January 2 for £12 deal, I couldn't resist heading back to the Mailbox to see what GBK was all about. The Burger: The 'Arnie Sarnie' is on fire on social media. Patty melts are not that common of a thing here in the UK, which is frankly baffling, therefore creating one and theming it to the Terminator is a genius move. 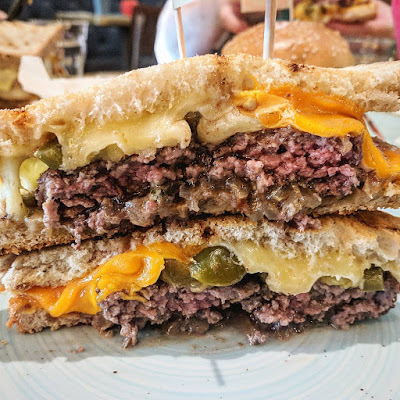 The 'Arnie Sarnie' includes a 6oz burger sandwiched between two slices of roasted onion loaf with mature cheddar, Red Leicester, Terminator sauce, jalapenos, caramelised onions and chipotle butter. The Good: To be served a perfectly cooked medium rare patty between a deliciously toasted onion loaf, oozing two types of cheese down the sides was a reassuring feeling. The cheese was certainly the most potent flavour, as expected given the volume and maturity. The jalapenos were well balanced offering a kick, but offset nicely through the caramelised onions. The Bad: I wasn't getting much through from the Terminator sauce, likely due to the overpowering cheeses. Whilst not necessarily a bad thing, a slight rebalance could have enhanced the flavour. I would have also liked some additional seasonings on the meat. The Summary: I take my hat off to GBK here. This was such a solid special and, to be completely honest, the best thing on the menu full stop. Patty melts, when done well, rival the traditional burger and I would smash my face in to one of these again any time. Let's hope it makes it way to the permanent menu. If it does... I'll be back. Eurgh. End of review. The 'Arnie Sarnie' is on until March 2018. Get it whilst you can! GBK have a rule during lunch that if they do not serve your burger in 15 minutes, you get the next one free. A dangerous game that kinda makes you wish your lunch won't arrive on time. The tomato ketchup bottles are shaped like tomatoes in here. Why do I enjoy that so much? Did I Dip It? Not necessary with that cheese ooze! Venue: I've already raved about Flying Cows once before here. Since then, these guys have only gone and won the '2017 British Street Food Awards' for best burger. Usually hanging around Digbeth Dining Club, if you're local and haven't had one of these burgers yet, you need to have a word with yourself. The Burger: I previously reviewed 'The Flyer'. The newer award-winning burger is aptly named 'The High Flyer': aged Dexter beef, cheddar cheese, Swiss cheese, diced red onion, club sauce, glazed smoked streaky bacon in a seeded brioche bun. The Good: Y'know what? Everything. Everything is good here. Sometimes you just know when you pick up a burger it's going to be perfection and 'The High Flyer' is just that. The aged Dexter beef is tender and succulent, paired perfectly with the smoked streaky bacon. The cheese is quite heavily applied, though due to the thickness of the patty, does not overpower the taste. And the club sauce, a typical burger sauce concoction, rounds off this perfect bacon cheeseburger. The Summary: The Flying Cows took their already incredible burger 'The Flyer' and perfected it with 'The High Flyer'. Everything about this bacon cheeseburger excels, from the meat to the cheese to the sauce. Make the journey and check these guys out. You won't regret it. The team are also a great bunch of guys, which is so refreshing. Can absolutely see the passion with every burger. The 'Toro Loco' burger is also as good as this one. In-fact, just get them all! Did I Dip It? Absolutely not. My social feed is often full of ‘Burger & Beyond’ posts, with stunning towering burgers beautifully arranged. 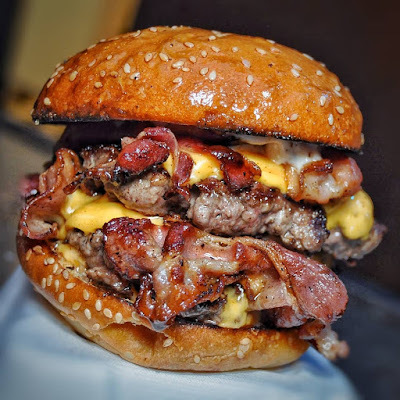 Located in Camden at the street food establishment known as ‘Kerb’, these guys are rocking the London burger scene. Instead of drooling over one of these bad-boys, I decided to get myself down there and see what the fuss is all about. The cheeky little truck overlooks the canal in the rustle and bustle of the markets in a sea of fantastic street food vendors. The menu is about as simple as it gets, pleasing me greatly. Aside from the ‘Cheeseburger’, you can get yourself the ‘Hot Mess’ (cheese and heat) or ‘The Cliff’ (brisket, cheese and Pancetta bacon). I wanted a classic, so I went down the cheeseburger route and chucked a bit of bacon in there: 45-day aged beef patty, double American cheese, pickled onion, smokey mayo and bacon between a fresh bun. After a short wait involving me pining over the glorious smell all around me, the burger was served within a tidy branded box. Let’s eat! The patty was cooked medium well (asked for medium rare) and was well-flavoured, though perhaps slightly too salty. Believe me, that’s quite rare for me to say too as I’m normally a salt-fiend. Still, the quality of the meat certainly shone through. The bacon perfectly complimented the beef with a deliciously smoky flavour, zig-zagged across the meat in all its crispy goodness. The cheese was quite heavily applied on to the patty (it is double cheese afterall! ), driving substantial flavour, though slightly draining the smoky mayo taste out as a result. Whilst this is not a huge problem, the burger does not offset the flavour with anything else e.g. burger sauce or ketchup. The biggest disappointment for me was the bun. I can’t help but feel like I was unlucky with this one, but the edges around the lower half of the bun were stale making it incredibly crispy, somewhat hindering the overall flavour. I can only imagine this was a one-off issue, however, as the rest of the bun was fresh and balanced. Perhaps the stars did not quite align on my visit to ‘Burger & Beyond’ as the magic was not entirely there. Whilst the ‘Cheeseburger’ was deliciously flavoured with high quality meats, the patty was slightly overdone on both cook-time and salt. In addition, the stale bun, though likely a one-off, can’t be overlooked when assigning a rating. Maybe next time I’ll go for ‘The Cliff’ and my mind will be blown. Let’s hope so. I can't emphasise enough how much I enjoyed Kerb and the surrounding food markets. Camden truly is an incredible place for food and drink. Did I Dip It? This cheese-monster needed no dipping.